Nintex Forms for NWC was just released yesterday, and just in time for me to add a contact form to my new website (https://www.docfluix.com). Matt Jennings already posted an awesome intro for Nintex Forms for NWC so check this out to understand what this awesome new product is all about. In my SharePoint site, I added an out of the box Contacts list, and customized it with a choice field (also named “CustomerInterest”) that allows multiple choices and includes the identical options above. After the Start Event, I added the SharePoint Online action Create an Item to my workflow and connected it to my site. When you define a Multiple Choice field in Nintex Forms for NWC, it creates a variable for that control of type collection. This collection shall be populated with only the choices that the user selected. In Nintex Forms for NWC, the title that is displayed for each control becomes the name of the start event variable created in the workflow. So in my form, the multi choice field is titled as “Are you looking for assistance with:“, and so that is also the name of the collection variable that I will reference in my workflow. In the Create an Item action, now I was able to simply assign the CustomerInterests text variable to the CustomerInterest SharePoint column. When this action executes we end up with a new list item in SharePoint with the intended choices selected. When I first started using using Nintex Workflow Cloud back in the early preview days, the first workflows that I created used various Start Events from both Nintex (Public Web Form, Nintex Mobile, Scheduled Start, External Start) and some external connectors (like Salesforce & Dynamics CRM). As I jumped into NWC and started creating some workflows, I would pick a particular start event (say Public Web Form) and implement my workflow logic. Then I might decide that I want to test the same workflow logic but using a different start event, perhaps Nintex Mobile or Salesforce. However, one cannot simply change Start Events if there are any references in the workflow to the Start Event variables. These need to be removed before you can change the type of Start Event. After developing a few processes with Nintex Workflow Cloud, I realized the best bet is to always put your core workflow logic in a workflow using the External Start Event. Create your core workflow using the External Start and add whatever start event variables that your workflow needs. Then implement the workflow logic and publish your workflow. Create a 2nd workflow, using whichever start event you expect the end users will need, such as Public Web Form, Nintex Mobile, Salesforce, etc. This workflow will need the identical start event variables as the first workflow. However, this workflow will only require one action. After the Start Event, simply drag the Call a Workflow action (from the Logic and Flow group) under the Start Event. After selecting the desired workflow, the configuration screen will display fields for each Start Event variable from the selected workflow. You can simply map the Start Event variables from the current workflow to the inputs of the workflow that you will call via External Start. After mapping the Start Event variables, you can simply publish your 2nd workflow. If you know you need additional ways to call your core workflow logic, you can immediately repeat steps 2 – 5 above using other Start Event types. By using the External Start event you’ll also be able to initiate your NWC workflow just as easily from Nintex for SharePoint 2013/2016 or SharePoint Online, using the “Start workflow in Nintex Workflow Cloud” action. Additionally, custom apps and other cloud services will be able to initiate your workflow using the OpenAPI (swagger) protocol. Even if you don’t need to initiate your core workflow logic in multiple ways, NWC makes it so easy to use this pattern that its almost always a good idea to start with the External Start event. You just never know when your business requirements might change in the future; And this way you (and your NWC workflows) will always be prepared for new requirements. This article is part 2 of a 4 part series, where we’ll cover the C# code for our custom connector for Nintex Xtensions and NWC. In part 1, I covered the project requirements and how to setup Azure and Visual Studio 2017 with Tools for Azure Functions. The goal of this project was to allow a workflow designer in NWC to query the GSA Per Diem API to lookup the allowed Per Diem amounts for Hotel and Meals based on the travel date and location of a trip. Below I’ll cover the GSA Per Diem API and the C# code for a wrapper function to make this API very easy to consume from Nintex Workflow Cloud. Accept an input value from Nintex Workflow Cloud of a specific date, rather than the FiscalYear. //returning only the max per diem allowed for meals and hotel based on the fiscal year and zip. Once the code is complete, you can publish again to Azure. I should also mention that there are a few ways to test and debug your Azure Function code, both locally (without publishing to Azure) or from Azure Functions. Many REST API developers use Postman, which is what I did as well. Before you can consume your Azure Function as a Connector for Nintex Workflow Cloud, you’ll need to define the Swagger definition file, which I’ll cover in part 3. Many people are familiar with Nintex as a workflow solution for SharePoint and Office 365, but last year Nintex released their Workflow Cloud offering (NWC), which has no dependency on SharePoint or Office 365. NWC comes with dozens of native workflow actions connecting to many different external cloud services, such as Salesforce, Box, Dropbox, Google, SharePoint, and many others. Nintex frequently updates NWC with new connectors/actions for additional cloud services. And more importantly, Nintex recently added an extensibility framework with a published SDK to allow developers to create their own custom NWC connectors. This new extensibility model is branded as Nintex Xtensions, and leverages the OpenAPI specification, (aka Swagger), which is considered the most popular open source framework for creating RESTful APIs. While Nintex Xtensions is well documented in their SDK & Help files, the documentation assumes that you (the developer) are familiar with how to write the code for for your custom connector as well as create the necessary Swagger definition file, which you need to import into NWC in order to configure your connector. I decided the easiest approach for me to create a custom Xtension for NWC was to use Azure Functions, which provides a scalable, “serverless”, compute-on-demand platform to host and execute the code. Additionally, Azure Functions includes tooling to generate the Swagger definition file for my code. And you can develop and test Azure Functions for free. 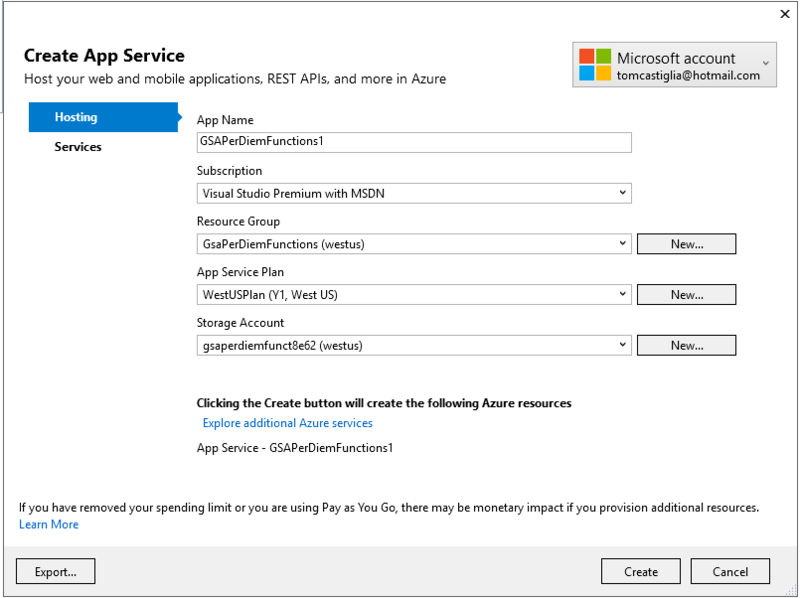 If your Azure Function is used in production, you’ll end up paying for the actual compute time. But Azure provides a limited amount of compute time per month at no cost, so for testing or a Proof of Concept, it would likely cost you $0/month. For my first NWC Xtension, I wanted to select a project where the coding logic would be routine, since I was learning a few new technologies (Azure Functions & the NWC Xtensions Framework), but also a project that would have some real-world value. Having implemented various projects in the past for clients to process Travel Authorization Requests and Expense Reports, I figured it would be useful to have an Xtension to calculate the allowed per diem expense amounts for hotels and meals. The U.S. GSA website allows government employees and contractors to lookup the max per diem amounts that can be reimbursed for hotels and meals. The GSA also provides a REST based Per Diem API that can be queried by year and location (Zip, County or City & State). This API returns a JSON message, containing the maximum per diem amount for meal and hotel expenses. The response contains a single value for the meal per diem and 12 values for hotel per diem (one value for each month, as the hotel per diem changes based on peak months when hotels tend to be more expensive). To simplify the requirements for my Xtension, I decided it would accept two inputs (Zipcode and TravelDate) and return two values (HotelPerDiem and MealsPerDiem). I then used Visual Studio 2017 to create my Azure Function as a simple wrapper around the GSA Per Diem API. I assume you’re reading this article due to your interest in Azure Functions and/or Xtensions for Nintex Workflow Cloud, not for GSA Per Diem rules. I expect that anyone reading this will adapt the concepts to whatever business logic or integration requirements that you may have. Although I’ve provided code samples for the GSA Per Diem integration, that’s only to ensure completeness of the content. 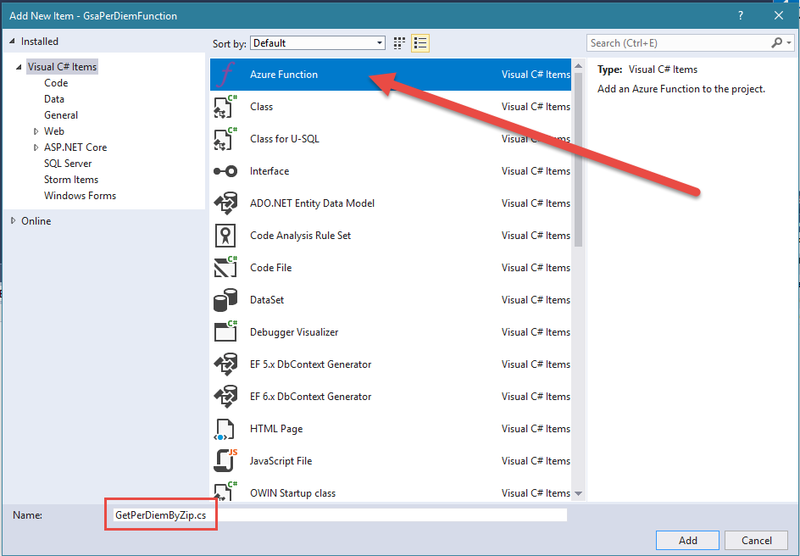 If you haven’t used Azure Functions before, before starting in Visual Studio I suggest that you Create your first function in the Azure portal to understand the basics of Azure Functions. Ultimately, you may decide you prefer to develop in the portal rather than in Visual Studio. But the rest of this article is based on using Visual Studio. Make sure you have an Azure subscription. If not, you’ll need to create a free account before you begin. Provide a project and solution name for your new function, select your desired folder location, and click the OK button. 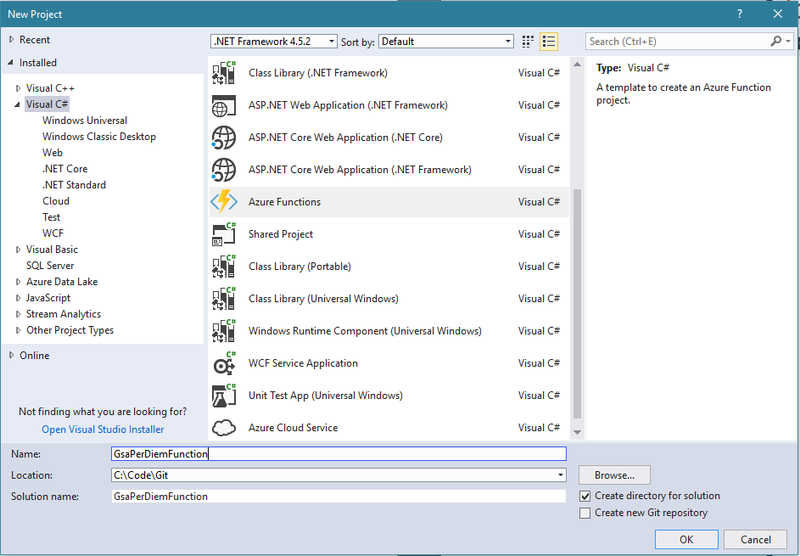 This creates the Visual Studio project which represents a single Azure Function “App”. 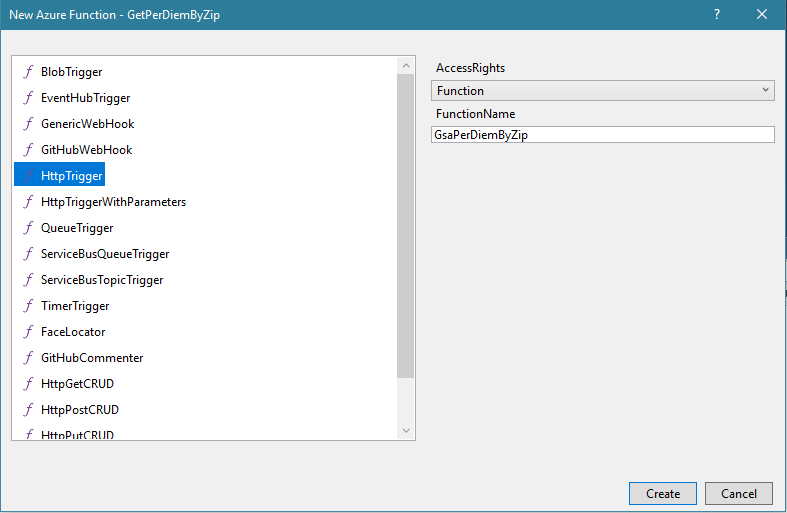 We can then add one or more individual Azure Functions to this App / Project. You’ll then be prompted to specify the type of trigger that this function should use. Since NWC will call our Xtension over HTTP, you’ll need to select the HttpTrigger. At this point, you can select the AccessRights (I used “Function”), and specify the FunctionName. I suggest using the same name as was used to create the C# class in the prior step. This will create a new C# so you can start developing your code. Note that at this point, everything has been done locally. Later, we’ll Publish our new Function App and any specific Functions to Azure. As we start and continue to write the code for our function, we can publish our changes as often as needed to Azure. Now that our Azure Functions project is setup in Visual Studio, we can start on our C#, which I’ll cover in part 2. So, this is my first Blog post in over 2 years, when I sold my share in Hershey Technologies to Konica Minolta. I never had a personal Blog before as I had simply used the HersheyTech website for my personal blogging. Since our acquisition by KM, I simply hadn’t gotten around to launching my own Blog. As a software consultant/architect with SharePoint and Office 365, I’ve worked on many projects covering many aspects of these products (collaboration, upgrades, migrations, intranets/portals, ECM, workflow, custom development, etc.). This Blog will cover all of these topics and more. But as the site name says, my focus here will be mainly related to Workflow (especially Nintex and Microsoft Flow) and Enterprise Content Management (with a focus on leveraging native ECM-related features in SharePoint and Office 365).